Ugali or sima as its called down at the coast is a very healthy meal which unfortunately no longer is a part of the daily diet for so many young Kenyans. Sausages, chips and other junk foods have become more convenient and appealing. However, it is still the basic meal for the common man. Ugali is made from white maize flour or what is commonly called here maize meal. 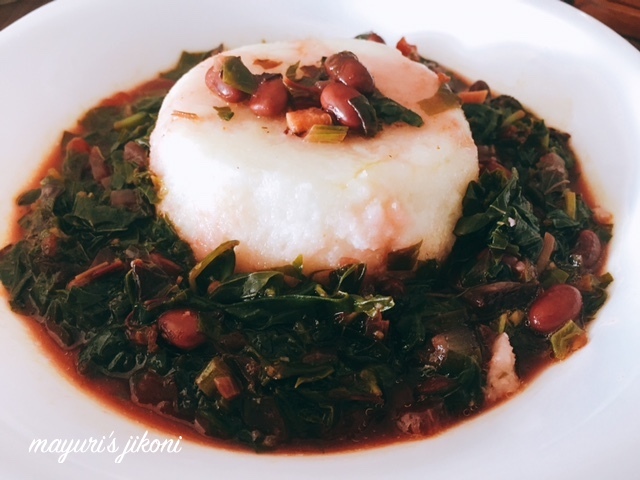 Filling, full of good carbohydrates, minerals and vitamins, ugali is very easy to prepare. I learnt how to make it from my house help Julius. However he still thinks I don’t know how to make it. But shhh, I do prepare it on his days off. Ajay loves ugali and we tend to make it often. I serve it with chicha (amaranth) and fresh red beans, sukuma wiki ( kale), cabbage vegetable or Neel’s orange dal. Most Kenyans have it with any meat, fish or vegetable dish. You can prepare the vegetable or meat dish ahead but make the ugali just before serving. Some homes make the ugali and then shape it into a big disc and put in a plate for the family to share. They cut pieces and serve themselves. Some prefer to make them into small oval shapes and dip in the stew. I usually like to put a huge disc shape on the plate and then everyone helps themselves. I also love to have it with a dollop of butter. Some add a bit of salt and some don’t. I prefer to add salt. Pluck the leaves off the amaranth stalk. Wash them thoroughly and chop finely. Stir fry the onion till it becomes soft. Add the tomatoes and turmeric powder. Cook for 2 to 3 minutes. Add the chopped amaranth, salt, water and cooked beans. Mix well. Cover the pan and cook for 5 to 7 minutes till the amaranth is done. When it comes to a gentle boil, remove 1 cup and keep it aside. Add salt and oil to the boiling water. Take the pan off the heat and add the flour. Mix very well using a wooden spoon. Add the remaining water, cover the pan and let the ugali cook over low heat. It is done when most of the water evaporates. Don’t let it cook for too long otherwise it tastes dry. Leave it a bit moist. Take a plate and put it upside down on the pan. Flip the pan over and the ugali will be on the plate. Can make the vegetable curry using kale or spinach instead of amaranth. For a softer ugali, add ½ cup more of water after adding the flour. Serve it with a dollop of butter. Tastes amazing. Can omit salt in the ugali. Try adding a bit of chilli and ginger to make it spicy. Add about 2 tbsp of maizemeal flour to the water when you put to boil. This prevents the ugali from forming lumps when you add the rest of the flour. I usually add the water that the beans are cooked in to the chicha. Fresh beans impart a lovely red colour to the preparation. Are the red beans same as kidney beans? Learnt a recipe from a new cuisine here. Thanks for linking it to ONLY gluten free.